I still think, sometimes, about all of the other people around me on the freeway when I’m stuck in traffic, crawling toward Los Angeles some morning on the 405. There are over 7 billion of us on the planet, all pursuing our own stories, and every single one of us believes that we’re the protagonist. We often fail to realize that the people we slot into the supporting roles in our own stories are doing just the same to us, and it becomes all too easy to skip over the part where everybody else is just as stuck inside of their own narrative as we are stuck inside of ours. All of those lives, rushing past us, stuck inside their own heads, trapped by their own perceptions. It’s kind of thrilling, but it’s also a little terrifying. “22 Short Films About Springfield” is mostly about The Simpsons showing off its versatility and creativity, which it does so winningly. But if it has a thematic point, something deeper underneath all of the jokes and the whirlwind of a script, it’s the idea that within the cosmos of Springfield are thousands upon thousands of people, most of them fully-developed characters, and all of them are worthy of their own shows, in many ways. “22 Short Films,” in an astoundingly generous manner, gives them all those shows, one minute at a time, circling back to a few of them and leaving others far behind. One of the big things the seventh season of The Simpsons does is show you just how thoroughly the series could be about something other than the family in the title. There are whole episodes where they barely appear. And “22 Short Films” is the show’s most potent suggestion yet that the main character of this series isn’t Bart or Homer or Lisa—it’s the town they live in. The structure of “22 Short Films” is dizzying and ingenious, one of the most complicated and complex scripts in television history. It’s one that needs to tell over a dozen small stories within one larger one, and it sometimes has only a minute or so to tell said stories. It was born out of season four’s terrific sketch, “The Adventures Of Ned Flanders,” used to fill out time in the end of the episode “The Front.” It gave rise to the thought that maybe the series should spin off some sort of rough anthology series telling smaller stories about the various residents of Springfield (about which you can read more in Noel Murray’s Very Special Episode column about this episode). It was more assembled than written, a dozen people credited on the script and all of them taking very short scenes. It didn’t quite get to 22 stories—by my count, it’s 19 or 20 (depending on how you split a couple of them)—but it kept the title anyway, a reference to a movie about Glenn Gould few in its audience would have seen. 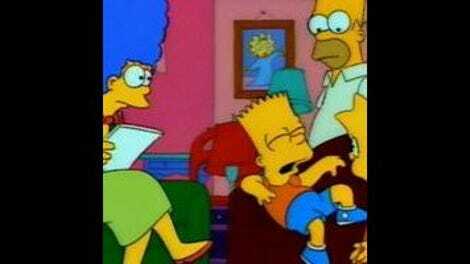 That was the wonder of The Simpsons at the height of its powers. The episode’s micro-structure is best exemplified by this early scene featuring Smithers and Mr. Burns on a bike ride. Each tiny story introduces characters we know well from having watched the show so long, in one of their established dynamics. It then introduces some minor pitfall—here, a bee that lands on Smithers’ eye—only to have everything devolve even further into chaos. The scenes are mostly excuses to tell great jokes. (Here, that’s Burns shouting at Smithers in outdated slang.) But they’re also all mini-stories in their own right, something that must have been murderously difficult to pull off. But the episode’s strength lies in the vignettes, which offer up miniature versions of all of the types of things The Simpsons could do at this point. The scenes with Wiggum and Snake (which eventually intersect with Milhouse and Kirk) are the show offering up its pop culture parody best, in this case doing a riff on Pulp Fiction. The Homer and Maggie vignette is basically something of an old newspaper comic strip come to life, while the short adventure with Bumblebee Man feels like a Mad magazine two-page spread playing out in all of its wild, unpredictable chaos. It’s hard to pick a “favorite” vignette in this episode, since they’re all like perfectly formed episodes of The Simpsons that take place over 30-90 seconds, but if pressed, I would likely pick out the extended, ridiculous gag in which Skinner attempts to convince Superintendent Chalmers that the hamburgers from Krusty Burger he’s served are not just fast food but, rather, “steamed hams,” which is what people call hamburgers in upstate New York, where Skinner is from. (Chalmers interjects that he’s from Utica and has never heard this particular terminology, to which Skinner insists that it’s more of an Albany term.) The conclusion of the bit—with Chalmers incredulously wondering how Skinner could have the aurora borealis at this time of year localized entirely within his kitchen—is wonderfully silly, and it understand fundamentally what makes “22 Short Films” and The Simpsons at its peak work: a perfect comprehension of these characters and how their dynamics function. The whole thing is framed as a sitcom within the sitcom—as are the bits with Apu and Cletus—and it’s a reminder of just how completely these characters function on their own, without anybody else around to bounce off of. I would be remiss if I went through this review without mentioning how wonderfully the direction of Jim Reardon complements everything that happens. It’s up to Reardon to find ways to tie the various vignettes together via as many creative transitions as he can think of. What’s amazing is how easily the show can float from location to location and never feel too breathless or overworked. The transitions are unfussy but efficient, and they keep an episode that could feel incredibly hectic from getting too complicated. Even though “22 Short Films” is one of the most complicated scripts the show would ever do, it has a very careful through-line that doesn’t try and strain too much. Reardon is essential to making sure that works, whether it means telling a little bit of the story from the point-of-view of a bee, or quickly matching objects in two different locations, so we can jump between them all the more easily. “22 Short Films” is not the kind of episode most shows would do in their seventh season, but it’s also the kind of episode that can really only work in the seventh season of a show, when the audience and writers so fundamentally grasp how the world and characters of a series fit together that there’s no need to spell it out. “22 Short Films” can simply show us two characters in a room, and we’ll fill in so many of the blanks that it needn’t do much more prep work beyond that. That’s both a sign of the show’s confidence in itself at this point and the rich background it had built for its characters and the town in which it was set. “22 Short Films” is fundamentally an experiment, an attempt by the series to do something different at a time when coming up with stories must have started to get exhausting. But it’s also a wonderful reminder of how everybody on this show was the protagonist of some other, weirder show. The Simpsons might have been the center of the series, but they didn’t need to be the only thing in it anymore. Springfield had ceased to be a solar system with them as the sun. Instead, everybody else had become stars of their own, and the show expanded into a galaxy. Or maybe I just like this episode so much because it features by far the Simpsons character who is the most like me: the very tall man driving the ridiculously small car. The geography of Springfield is always interesting to me. I can’t think of another episode that suggests the Kwik-E-Mart is so close to a highway overpass, but it would seem that’s the case in this episode, at least. I think my favorite thing about the Homer vignette is that, for whatever reason, he doesn’t bother getting a quarter to let Maggie out of the newspaper dispenser once he’s toted it all the way home. Santa’s Little Helper likes EZ Cheez, as should we all. This episode has many choice quotes and bits, but I think the one I turn to most often in times of trouble is Professor John Frink’s theme song for himself. He’ll make you laugh! He’ll make you think! In an episode where so many jokes are so pitch-perfect, there’s always been something a little lazy about Lisa saying she “smells like a sandwich” when her hair is covered in peanut butter and mayonnaise. You don’t say, Lis. There’s something a bit strange about seeing Bumblebee Man without his costume, but there’s almost something stranger about seeing Wiggum without his hat. 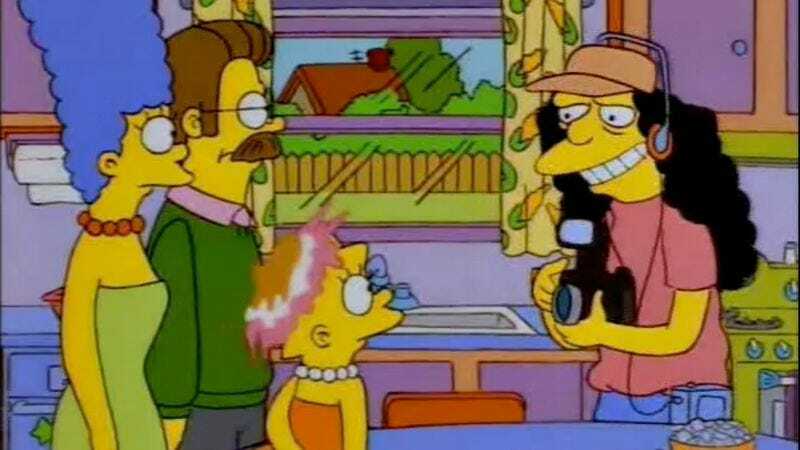 I love the thought of Otto selling that photo of Lisa to Fangoria, of all publications. Why would the horror magazine want a picture of a little girl with gum in her hair? Who knows, but Otto is pretty sure he can make a few quick bucks off of it. Just try and tell me you wouldn’t watch an ER clone starring Dr. Nick.